A motive or phrase is “sequenced” when it is repeated several times beginning on different pitches. Each repetition keeps the pattern of intervals the same as those in the original motive or phrase. Sequences usually move in only one direction. That means each successive sequence moves either up or down. If there are three sequences of the original motive or phrase, each successive sequence would begin on either a higher or lower pitch. The pattern would be UP- UP - UP or DOWN - DOWN - DOWN. The pattern would never mix directions. UP - DOWN - UP is not considered a proper sequence pattern. The intervallic structure of a sequence may change to fit within the chord structure of the melody. The choice is between maintaining a consonant relationship between melody and chords or intentionally creating tension between the chords and the pitches of the melody. 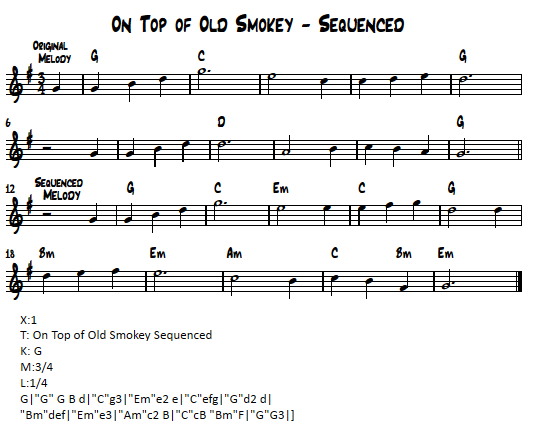 Here's the original, unedited version of On Top of Old Smokey and a sequenced version of the melody. At the end of the third full measure, the sequenced melody changes from the original. It's a higher pitch. That portion of the melody has been sequenced. Note also that this create new chord choices. Sequencing is one of the most frequently used techniques for developing motives and phrases. Here's a real world example of a melody using the technique of sequencing. I composed this 37-second piece as an audio cover for a scene change in the play The Curious Savage. The motive came from text in the script: You Startled Me. I trust you can hear those words in the melody of this scene change music. Listen to the audio to hear the sequencing technique in use. Here is the chronology. 21 - 37 seconds: The piece shifts into a motive that runs throughout most of the scene change music in the play. The play is set in a sanitarium. The residents have "issues". Throughout the play the scene change music is grounded in reality and then moves into a realm of uncertainty and confusion. That's why you'll hear an abrupt transition at 21 seconds. This jarring contrast reflects the action of the play.